RAMS management and minimizing of life cycle costs are the centre of VADEMSAŞ’s company philosophy. 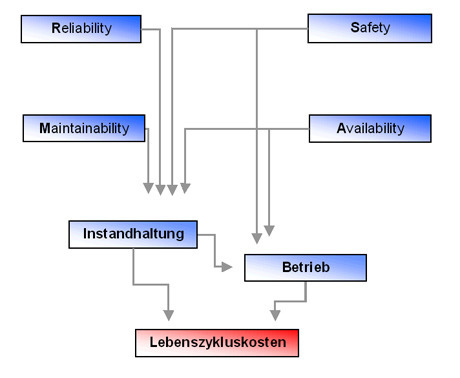 The close connection between safety, reliability and life cycle costs asks increasingly for optimized products with regard to reliability, availability and safety. Within the scope of the RAMS management of VADEMSAŞ analysis of risks, reliability, maintainability and safety for each product are carried out in accordance with EN 50126 standards. The goal of our RAMS management is to minimize potential risks for humans and the environment and to maximize the reliability and safety of our products. RAMS management and minimizing of life cycle costs are the centre of voestalpine VAE’s company philosophy. For all organizations that act more and more cost-consciously, considerations of life-cycle costs are gaining in importance. This is also true for railway companies all over the world. VADEMSAŞ has been facing these challenges for many years and responds to these new requirements with special solutions. Apart from product prices, maintenance costs have a significant influence on life cycle costs.